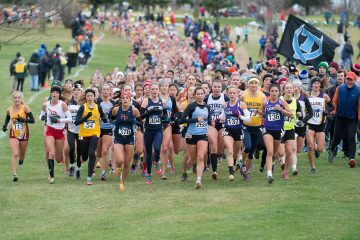 The University of Wisconsin Oshkosh and the Oshkosh and Winneconne communities are preparing to welcome the top runners from around the nation as hosts of the 2018 NCAA Division III Cross Country Championships. The championships are set for Saturday, Nov. 17, at Lake Breeze Golf Club in Winneconne. A total of 64 men’s and women’s cross country teams will partake in the championships. Along with the 32 seven-person rosters for each gender, 56 individual qualifiers for both will also participate in the top Division III cross country meet of the year. That means a big influx of visitors will be descending on Oshkosh as early as Wednesday, and Amy Albright, executive director of the Oshkosh Convention and Visitors Bureau, can’t wait. The event will bring student-athletes and fans from California, Maine, Maryland, Massachusetts, New York, Pennsylvania, New York and Vermont, to name a few. The Titans are hosting the prestigious event for the fourth time overall and third time in the past eight years. UWO also hosted in 1999, 2011 and 2015. UWO itself has three Titans who will run for a national championship Saturday. Titan women’s runner Evlyn Noone placed eighth at the NCAA Division III Women’s Cross Country Midwest Regional to secure a spot in the national championship, while men’s runners Lucas Weber and Cody Chadwick finished 21st and 26th, respectively, to claim a spot in the men’s national championship. While Oshkosh is hosting the Div. III national championship, UW-Madison will be hosting the NCAA Division I Cross Country Championships concurrently in Verona. With these two high-profiles cross country events, along with a Foot Locker Cross Country Midwest Regional Championships taking place in Somers, Wisconsin, Gov. Scott Walker has proclaimed the week of Nov. 17-24, 2018, as Cross Country Week. The Div. III national championships will begin with the women’s 6,000-meter race at 11:15 a.m., followed by the men’s 8,000-meter race at 12:15 p.m. Spectators looking to attend the event can park at Winneconne High School (100 Wolf Run, Winneconne, Wisconsin, 54986) and use the shuttle service for a $5 round-trip fee.